SAN FRANCISCO (KGO) -- Kris Bryant tossed his glove high in the air, Jake Arrieta jumped over the dugout railing and the rest of the Chicago Cubs rushed to join the celebration. Pure revelry and a sigh of relief, all at once. World Series favorites since opening day, the Cubs took another step in their championship chase Tuesday night by rallying for four runs in the ninth inning of Game 4 to beat San Francisco 6-5 and win their NL Division Series. "You could see it coming. You could see little signs. We've done it before and the guys, we don't quit," Cubs center fielder Dexter Fowler said. "It's a little more special doing it here. They for sure were thinking that they won it. But we play 27 outs and we don't give up until we win." Javier Baez's tiebreaking single capped the comeback against a beleaguered bullpen that sabotaged the Giants one last time. The team with the best record in the majors this year will open the NL Championship Series at Wrigley Field on Saturday against the Los Angeles Dodgers or Washington Nationals. That matchup is tied 2-all heading into the deciding Game 5 on Thursday. "I've seen it so many times from this group. It's a big part of our philosophy," manager Joe Maddon said. Seeking their first World Series title since 1908, the Cubs will get a few days of rest before opening the NLCS. Chicago was swept by the New York Mets in a four-game NLCS last year. Held to two hits over eight innings by Matt Moore, the Cubs trailed 5-2 heading to the ninth. Now, they're headed back to their second consecutive NLCS after snapping San Francisco's 10-game winning streak when facing postseason elimination. Pinch-hitter Willson Contreras tied it with a two-run single with none out. 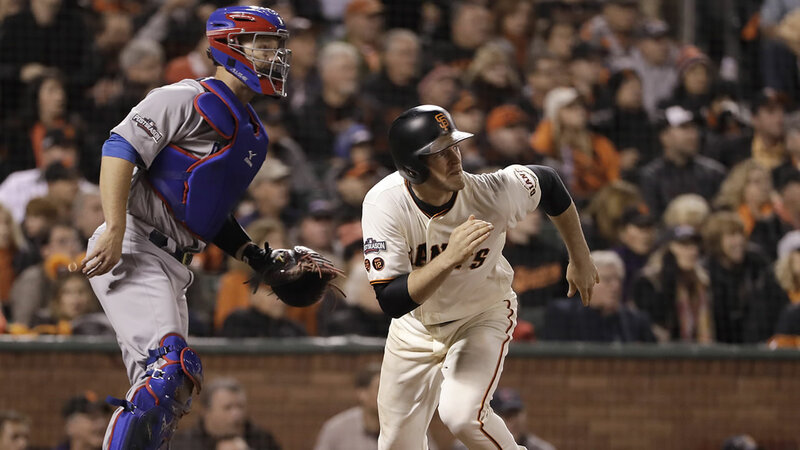 Baez singled in the go-ahead run two batters later, and the Cubs capitalized on Gold Glove shortstop Brandon Crawford's second costly error and more untimely blunders by the Giants' once-reliable relief staff. One day after getting tagged in the eighth inning, Aroldis Chapman closed this one out by striking out the side in order. When he set down Brandon Belt to end it, Chapman's teammates rushed to the mound to hug him and begin their celebration. After finishing off the resilient Giants, Maddon should have his rotation all lined up because lefty Jon Lester wasn't needed to pitch a potential Game 5 in the Division Series. Maddon has his confident, power-hitting Cubs on quite an October roll. They already beat All-Star Johnny Cueto and ex-Cubs pitcher Jeff Samardzija, then waited until Moore's stellar outing was done to pounce. Downright unflappable for years in these pressure-packed scenarios, the Giants had won 10 straight games when facing postseason elimination. The World Series champions in 2010, '12 and '14, their every-other-year title chance is over in '16 with the club's first postseason series defeat in the last 12. "We don't think we're going to win the World Series every even year. I mean, it took 50-something years to get one here," quipped Giants manager Bruce Bochy, whose bullpen management was scrutinized throughout a disappointing second half. The orange towel-waving sellout crowd of 43,166, perhaps spoiled this decade by the every-other-year title success, had been counting on a few more games by the bay this October. Moore, acquired from Tampa Bay at the Aug. 1 trade deadline for games of this magnitude, struck out 10 as his former Rays manager - Maddon - watched from the other dugout. Long after Cubs starter John Lackey's night was done, Hector Rondon pitched the eighth for the win. For more stories about the San Francisco Giants, click here.